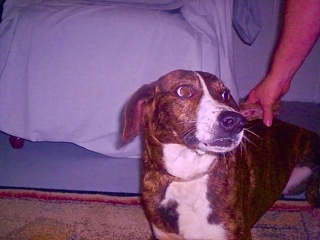 Lady is a pure bred Mountain Cur. She is very sad. She has never had a home where she was loved and cared for. What kind of owner would take this young, beautiful dog and dump her at a kill shelter and never give her Heartworm and tick preventives? The answer is one who doesn’t deserve a pet, an innocent animal looking for love, not neglect and abuse. Lady is up-to-date on shots. She does not hunt. Lady is currently heartworm-positive. She’s on Heartgard and Nexgard and is currently being treated for heartworm. Please help us find that special person who will love her and give her the life she’s longed for and never known.